Why winter cruises you may ask? Well, the simple fact is that they allow you to take advantage of the non conventional climate of certain locations. Since Winter is usually associated with fairly low temperatures, white landscapes, Christmas celebrations and a lot of cozy moments indoors, there are so many alternatives, depending on where you have chosen to spend it. Think gorgeous exotic islands for starters. Imagine pristine beaches covered in fine, ivory sand and waters so transparent they are the absolute reflection of the sky’s blue. A place often referred to as the earthly “Garden of Eden”, and that is Seychelles. 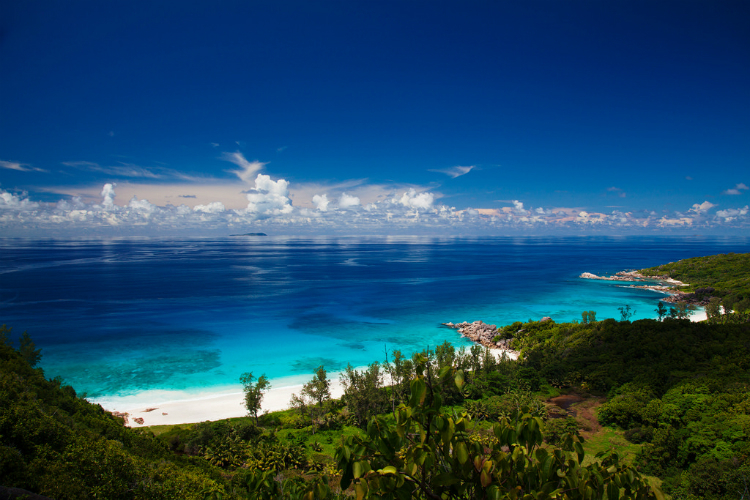 Consider the following reasons to choose Seychelles for a winter cruise. The archipelago of Seychelles harbors unfathomable natural beauty and visiting this destination at least once in your lifetime is somewhat of a privileged necessity, if I may coin the phrase. A popular destination for millions of people around the world, it offers visitors with stunning visuals that remain etched in their minds for years to come. Places like La Digue and Anse Lazio exist to showcase the primordial impeccable beauty of nature, while Victoria on Mahe island is the urban side of Seychelles, exposing a culture that is based on the simple ways of life. The Seychelles have the added advantage of wonderful climate all year round. Over the summer months they have warm rather hot temperatures, while during the winter they boast cool instead of cold temperatures. During wintertime, they typically enjoy 27 degrees Celsius, (i.e. 80 degrees Fahrenheit) and this allows for the smooth sailing from island to island, for sunbathing on the deck, for swimming in the azure waters, for exploring their rich depths and for discovering the intoxicating essence of this paradise on Earth. There is something resolutely relaxing about cruising; you embark once and get to experience a handful of places without lifting a finger. Ease, comfort and understated luxury while on board are three elements that make the Seychelles all the more enjoyable. A set itinerary that guarantees you will visit all the top highlights and optional excursions mean you can get involved as much or as little as you want. The activities that this destination also offers means you can be as active or as lazy as you want; snorkeling, diving, windsurfing and other water sports versus trekking or hiking and golf. Take your pick, or opt to just relax on the deck of the cruise ship and replenish your energy to last you until the following summer. Tell me about your winter escape... Is it someplace warm and beautiful like this? Wonderlands of Wellness: 5* Spa Getaways for Winter + Spring! Wellness is a holistic aim that will elevate your mind, body and spirit with benefits that you can feel inside and out. It is a perennial, personal goal and is an objective for all seasons, and for all time. A large part of achieving wellness depends on the expertise of professionals. This important ‘spa-seeking’ niche has become a MUST for luxury travelers. Combining travel with the aim of wellness and staying at a spa hotel, is one of the best ways to achieve wellness goals. If you are looking to do so in the next six months, here are two sensational worlds of wellness, waiting for you to take the ...plunge into deep relaxation, rejuvenation and revitalization. Considered a landmark, and with natural thermal springs that date back 4000 years, the Thermae Sylla Spa Wellness Hotel in Edipsos is a bastion of wellness, offering its healing powers to those in search of them, since its foundation by Roman General Syllas in 1897. What started as a miraculous medicinal water spot, has been renovated to a full scale 5* Spa and Wellness Hotel with contemporary levels of understated luxury, providing numerous specialized spa treatments & therapies to cover wellness, medical, fitness and aesthetic needs. Apart from all the need-specific therapies that are available, the thermal spa of Thermae Sylla has a natural balneological advantage, making it an ideal wellness destination that you can enjoy all year round! - Constant water temperatures around 28-30 degrees Celsius, allow guests to be fully submerged in the healing properties of the outdoor thermal pools. Hydrotherapy has increased advantages during the colder winter months; when you’re body is considered more ‘fragile’, this is precisely the time to fortify it! - Soaking in thermal spring waters can improve your health while boosting your immune system. The cold of the outdoors in combination with warmth of the mineral-laden water, will make your body sweat out more toxins, washing away colds and flu bacteria for that season. - Hydrotherapy can be combined with exercise programs, either as post workout recovery or as part of the workout such as aquatic bodywork or the more passive, one-on-one, aquatic therapy of Watsu. - Beat the winter blues by seizing the outdoors and gazing at the beautiful winter landscapes from the warm comfort of the external thermal pools, or from inside the luxurious interiors. - Have a stress-free Christmas break, without worrying about all the things that are involved in hosting a Christmas party at home. Use this Christmas break to work on your wellness goals, and return fully recharged, ready to take on the New Year. A splendid, recent addition to Europe’s balneotherapeutic centers is almost a ...mirage of well being, located in Halkidiki’s Kassandra peninsula on an alluring and sandy, pristine beachfront. The cosmopolitan Miraggio Thermal Spa and Resort, completed its first ever season this year, combining thermal wellness options with state-of-the-art facilities and truly stunning scenics. Due to its idyllic seaside location, the Miraggio is the ultimate spring/summer destination when you can fully exploit all the 5* facilities, plus all the stunning features that make this resort the newest gem of the balneotherapy family. - Thalasso sessions packed with sea mineral goodness. - Thermal therapies loaded with valuable trace elements from hot springs. - Spa treatments to nourish your skin and muscle tissues. - Fitness & Motion activities to kick start your metabolism. - Medical Wellness consultations to get to the grips with your needs. - Healthy Eating advice to help you see results even faster and to re-educate your nutritional choices. By holistically combining all the above in individually tailored programs, you’ll soon feel the transformation into a new you! And your enjoyment doesn’t stop there. You can chose to sail off from the resort’s marina and explore all the nearby coastal treasures of Halkidiki. Numerous sport activities are available within the vast 330 acres of the resort, as well as over 10 restaurants/bars to choose from, with signature menus of a healthy-gourmet orientation. Wellness has never been this easy to achieve, in any season. By choosing to visit a legendary luxury thermal spa hotel during Christmas or by booking your days in paradise at a brand new thermal spa resort next Spring, your wellness is a shoo in. So go... It's my favorite time of the year! !